When Hitler came to power in Germany and began to build up the country's military strength, British politicians realised that the country was totally unprepared to fight a possible war. The main danger was seen to come from German bomber aircraft which would not be detected by existing technology until it was too late to do anything to counter their threat. A research progamme was set up to experiment with producing more advanced early warning systems which eventually led to what became known as RADAR. To start with, a system consisting of steel towers and wooden towers was to be built in strategic positions near the east coast of England. It was code named “Chain Home” and Canewdon was to be one of the sites. RAF Canewdon was built in 1936 as one of the 20 stations in Chain Home. Just six months before the start of World War 2 all 20 stations were operational 24/7. They worked by detecting enemy aircraft at sufficient distance from the coast for fighter planes to be scrambled to intercept the bombers before they reached their targets. Before the end of the war the technology at Canewdon became obsolete but after the war the towers were used for training purposes (see Paul Bennet's Climbing Test) and the site was not fully dismantled until the 1970s. One of the Canewdon steel towers was re-erected at the Marconi research facility at Great Baddow and is one of only five of the original 60 towers still in existence. 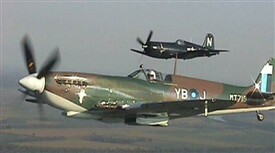 The Ex-RAF Aerial Erectors Association website can be found here. The site contains more information about the various aerials used by the RAF including those at RAF Canewdon, scroll down the main page for Canewdon material and personnel. 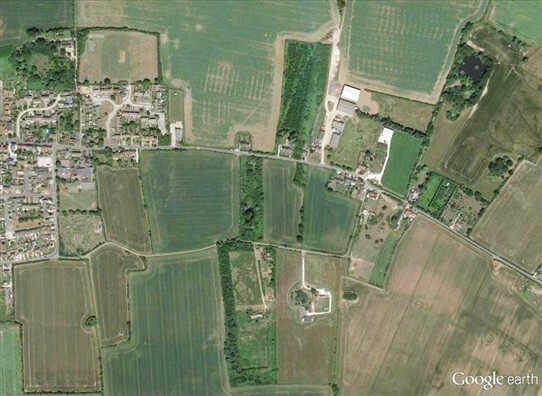 Also find a report on Defence Area 48 (Canewdon) here. Thanks to Sid Barker for providing these links. 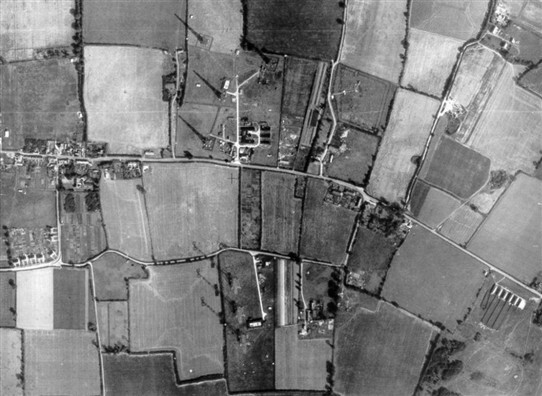 Thanks to Peter Thomas for providing the two maps above, the first is an aerial shot showing the Chain Home site in 1948 and the second is a modern Google Earth map of the same area. This page was added by Sue Horncastle on 18/11/2013. Hope you'll permit this, but may I suggest some corrections to your info based on many years' research into the relevant files at Kew and Hendon, correspondence with veterans, etc? 1)The 4th steel tower was not removed from Canewdon because the Germans had failed to jam, but because it was needed for an emergency radar station in Northern Scotland after the Germans invaded Norway in 1940 (the same applied at Dover, Rye, and Great Bromley). The Germans did not decide not to jam because they mistook the transmissions for leakage from power cables (that's absurd), but because they did not recognise the Chain Home stations for what they were till mid-1940. They then DID try to jam, periodically, but devices were added to the CH receivers to prevent this. 2)The small underground rooms and off-site tower bases, away from the main station, were for a mobile reserve set up in 1940/41, and a Buried Reserve built in 1941/42. The former had 87 or 105-foot collapsible towers, the latter 120-foot permanent ones, both timber. 3)Erection of the original 240 (not 230) foot towers began in 1936, but was not completed till 1938. 4)I don't recognise the ash-sprayed-with resin business--the specification was for Canadian pine, creosoted--perhaps your ash is for something else? 5)Canewdon did not have a Chain Home Low, at least in wartime, as Walton and Foreness covered the Thames Estuary between them. It did have a Gee slave transmitter, but this was probably on an existing mast. At other sites the 4 wooden masts lay in rhombus, not an exact square. 6)The T aerials were slung between the towers only from 1941--earlier they hung down from cantilever to cantilever. I've done a full study on Gt Bromley CH, which is still in print and is also at IWM, Bawdsey, Ian Brown's radar archive, Purbeck etc (see Amazon). Many thanks for letting me contribute. I have a passing interest in the history of the Chain Home site at Gardners Lane, Canewdon and thought you'd be interested in a Powerpoint presentation that I've cobbled up to form a sort of 'then and now' transition. I had to spend a bit of time getting the scaling right but feel it was worth it in the end! Hope it's of interest; you're more than welcome to post it on your website if you wish. Kind regards, Peter Thomas. RDCA Admin: Thanks Peter, your two images are now to be found above at the bottom of the article (for technical reasons they cannot be posted here in the comments). Just to add a side note to this. The Southend and District Radio Society used the Canewdon mast and site for amateur radio use on a few occasions in the 1960’s and early 1970’s. The society, that dates back to the 1920’s and who installed the first radio system in Southend Hospital still exists and meets once a week at the Ekco Sports and Social Club every Tuesday evening. The last wooden mast was on the North site in the field next to what is now the village hall. It was used by the Marconi Company for testing and for a time was used for the government jamming of pirate radio stations. It was eventually pulled down with some difficulty in the 1970’s when the site was cleared for use as farmland. In 1961 my mate Graham and I climbed the last tower which was the wooden one. We climbed over a gap in the fence via a pillbox on the eastern side. Sure was a great view from the top!! We also checked out the second site off Gardeners Lane. It had a large log-periodic antenna system (pointing east off course). We wandered into the blockhouse and saw the radio gear humming and clicking. Needless to say we made a rapid exit. We were a couple of 17 year old radio mad "nuts" and were working towards our ham radio licences so curiosity was our motive. Still working ham radio here in NZ now 71. Thanks for your comment Kathleen. It would be great if you could let us have some of your memories, there must have been some scary times as well as a lot of laughs. I was stationed at Canewdon as a radar op. in 1944. The layout of the towers at Canewdon was not the same as other CH sites making photo identification of Canewdon easy. There were originally four steel 360 foot transmitter towers on the south site all in a north to south line. The bases for these remain and can be seen on Google maps. (All later CH sites only had three transmitter towers.) Each tower had its own transmit frequency and transmitter set. The idea was that if the enemy attempted to jam the signal the station could be switched to another frequency within a few minutes. However it soon became apparent that the enemy had no idea what was going on and they actually thought the signals were from poorly shielded mains electric cables, so they never did try to jam the signals. As a result quite early on in the war when other CH sites were still under construction the southernmost steel transmitter tower at Canewdon was dismantled for use elsewhere. However what set Canewdon apart was the layout of the four wooden 230 foot receiver towers on the north site that were not in the usual square pattern used at other CH sites. They were in fact set out in a T configuration with the lower part of the T pointing in an approximate SW direction. 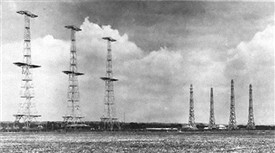 There is a 1948 aerial photo that clearly shows the four receiver towers in this configuration, the three surviving transmitter towers and the base for the fourth. It also shows the concrete bases for the 70 foot tower used at the ‘Chain Home Low’ site set about 200 yards to the east of receiver site down Gardeners Lane. This photo (in low resolution) is on page 2 of this pdf (but please note there are errors and omissions in the text). As it happens in the 1950’s two of the smaller 230 foot wooden towers from Canewdon were dismantled and moved to Foulness Island and were used on one of the ranges for supporting targets. They lasted until the mid-1980s before they were replaced with the two steel towers that are still in use today (the concrete bases survive). The wood used on these wooden towers was ash that had been high pressure impregnated with a two part epoxy resin making the material virtually indestructible and impervious to the weather. The individual sections could actually be bent at 90 degrees without snapping! I have a copy of the original manufacturers blueprints. Possibly so Brian, as the ground does seem to be rather flatter and more extensive than one would find at Canewdon! However the layouts of transmitters and receivers were virtually identical for all Chain Home sites (three or four steel transmitting towers in a straight line and, separated by a short distance, four wooden receiver towers arranged in a square). The only thing missing from the photo are the actual transmission and reception aerials which were in fact complex curtains of wires strung between the towers - for the transmission towers the outer edge of each platform was used as an attachment point for the curtain. This Wiki on Chain Home is interesting if a bit technical in places. Please note that the photo showing the 7 towers is not Canewdon. As a kid in the 1970s I can remember going into the buildings on what we called the Air Ministry - the equipment and furniture was all there but mostly flooded. There were other underground bunkers which were completely flooded in the paddock at the end of Back Lane going towards Scotts Hall Farm - looking back it seems kind of dangerous now, but then these places were fabulous playgrounds.